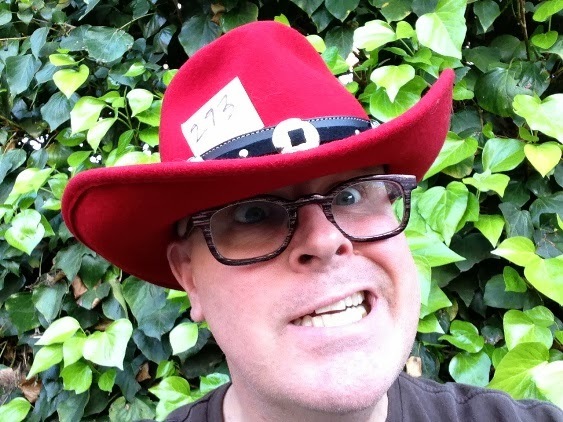 Day 273 / Hat 273: Red wool felt outback-style hat with black leather hatband and three round, silver-colored buckles. Oval-shaped tag on interior of crown reads: "Silverado," and hatband tag reads: "Made in U.S.A., large, WPL 4284, 100% wool." This is the penultimate loaner to the Project from The Headwear Association's sample closet and Silverado is a brand made by the folks at F&M Hat Company (the same ones who made PC 265). According to the attached tag it's a style called "Addison" and the wool fabric is something called "Dri-Lex Eco," which means it's "made with recycled, renewable or sustainable yarns." I'm guessing this qualifies as sustainable due to the fact that sheep can be sheared and sheared again year after year. That is as long as you don't leave the barn door open so they can have free and unfettered access to 50 pounds of grain and overeat themselves into an early woolly grave -- a lesson I keenly learned early in my rural Vermont sheep-raising childhood. Carry that with me a long time? Yes, I guess I did.